Little Goblins Ten by Pamela Jane, illustrated by Jane Manning. 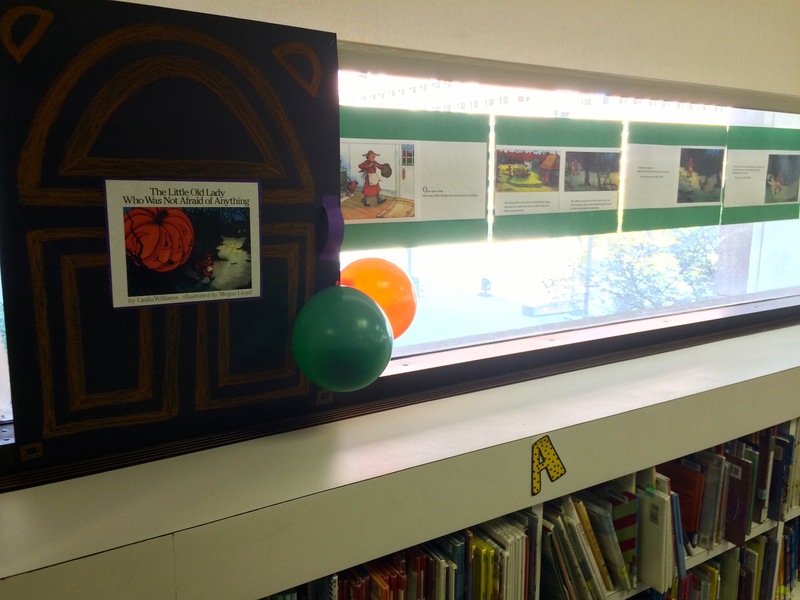 These books were replicated and hung around the room for patrons to walk and read through, while also enjoying a variety of extension activities related to the books. 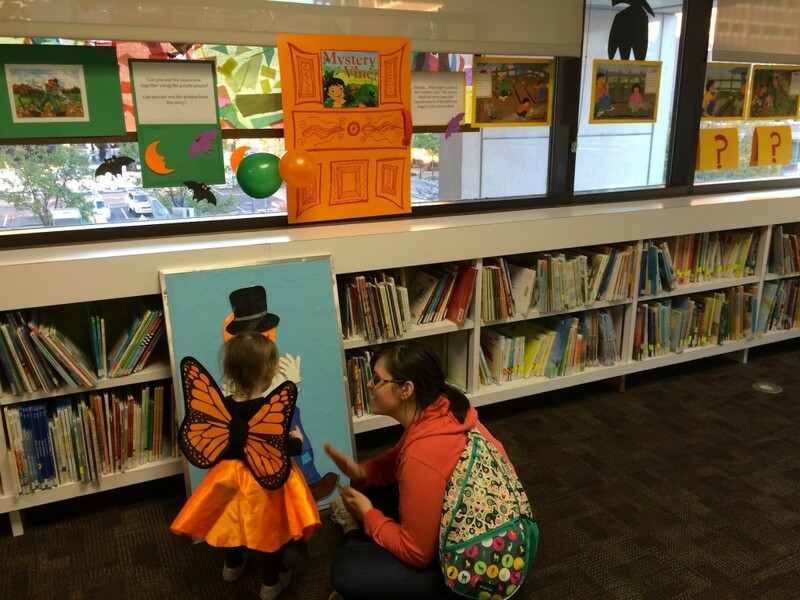 The opening storywalk reveal, “Trick-or-Read”, was a 3-hour drop-in evening program and the kids were encouraged to dress up in their costumes— And they did! 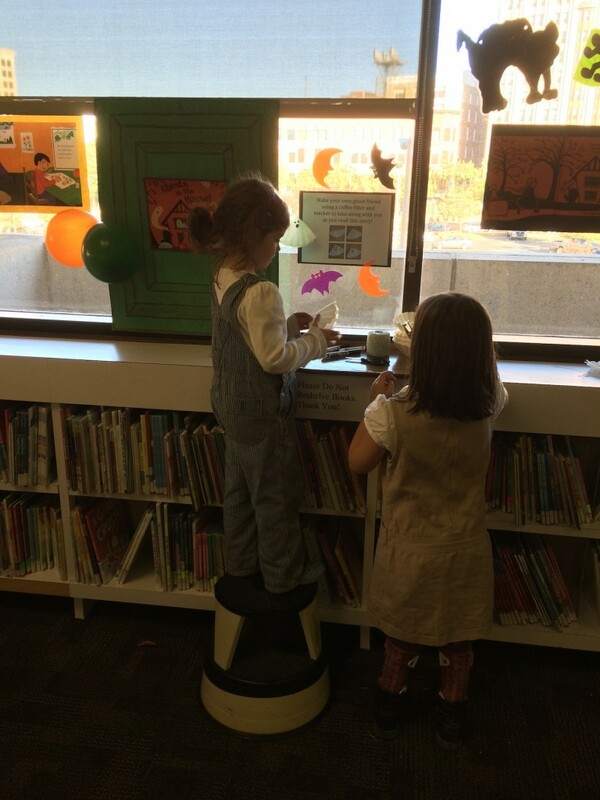 They could read the stories with their families and after they were finished, come up to me, say “trick-or-read”, and receive a free book! 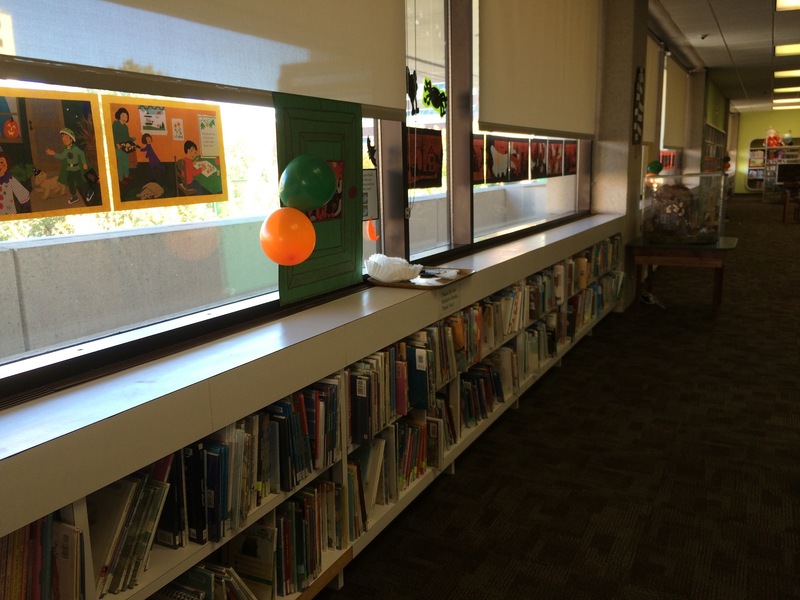 The books given away were leftover books from various events or past summer reading programs. Macmillan Kids was awesome to send along library card holders with the artwork of Kazuno Kohara (Midnight Library, Ghosts in the House!) as an extra treat for kids. 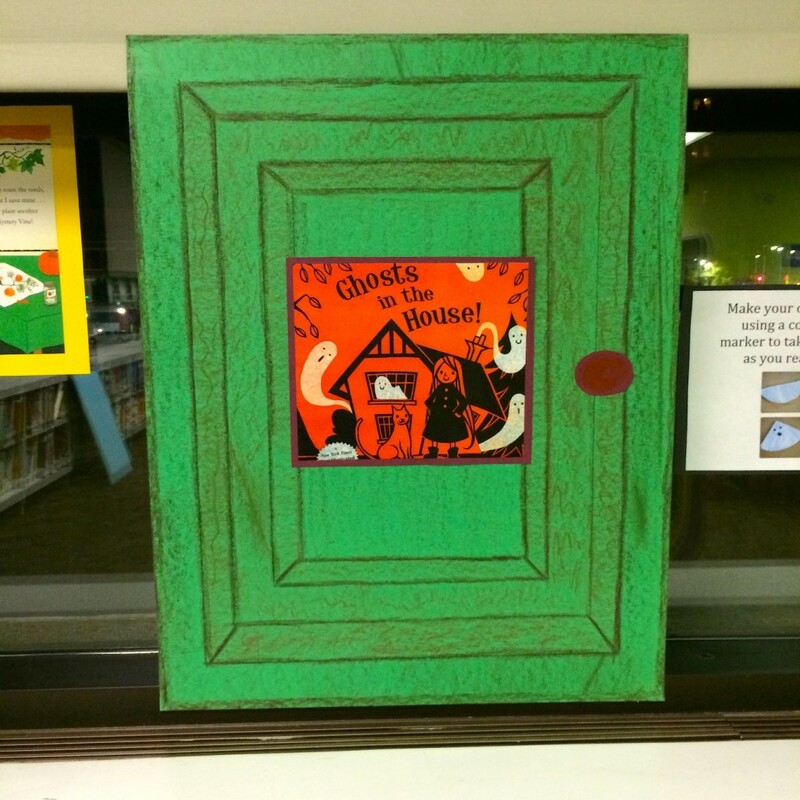 This story started with a door with the book cover on it (trick or treat!) and either starts with an activity or ends with one. 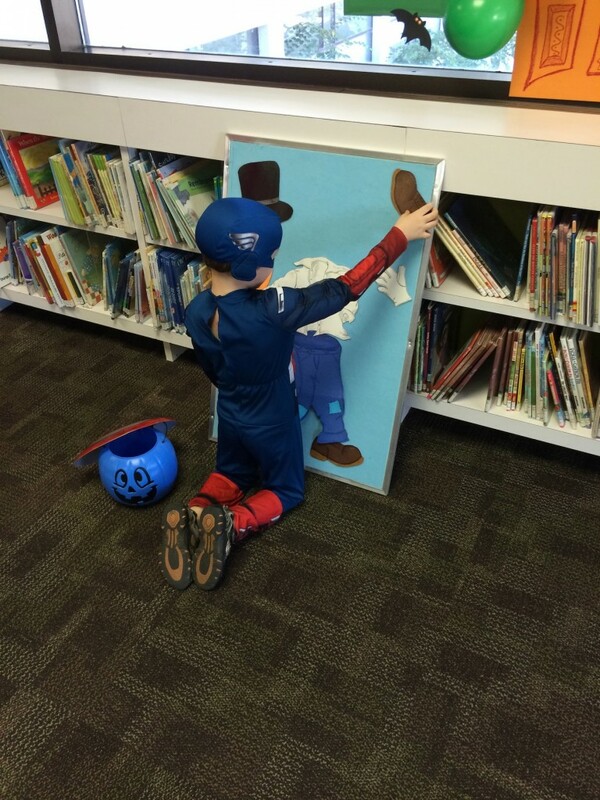 This book ended with putting together the scarecrow in the book on a flannel board and doing the actions from the story. If you are interested in recreating this activity, I found this handy template via Toddler Approved. 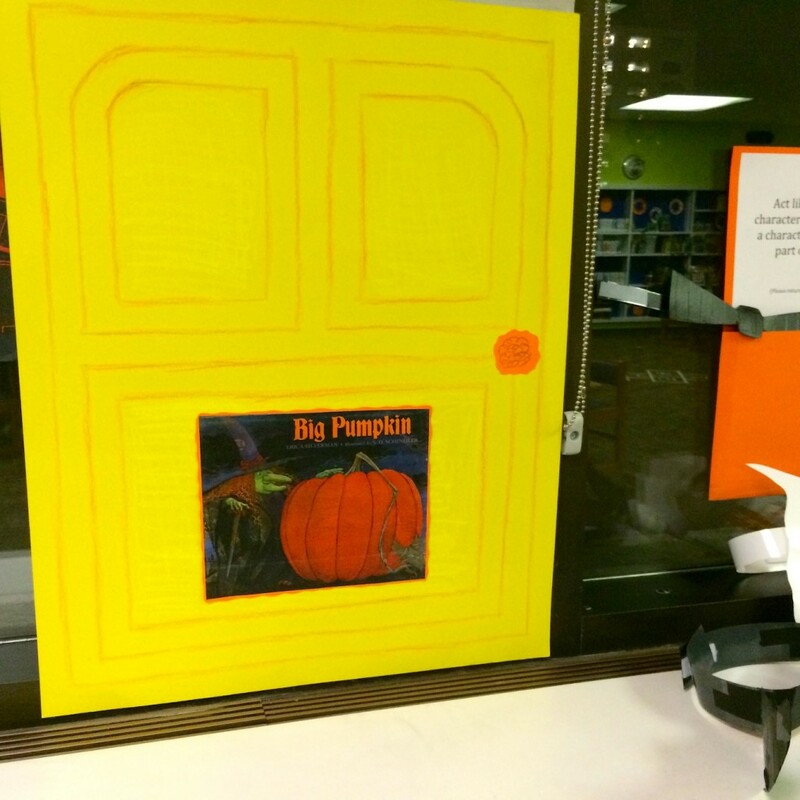 I paired actual pictures of the various life cycle stages of a pumpkin with the illustrations in this book. 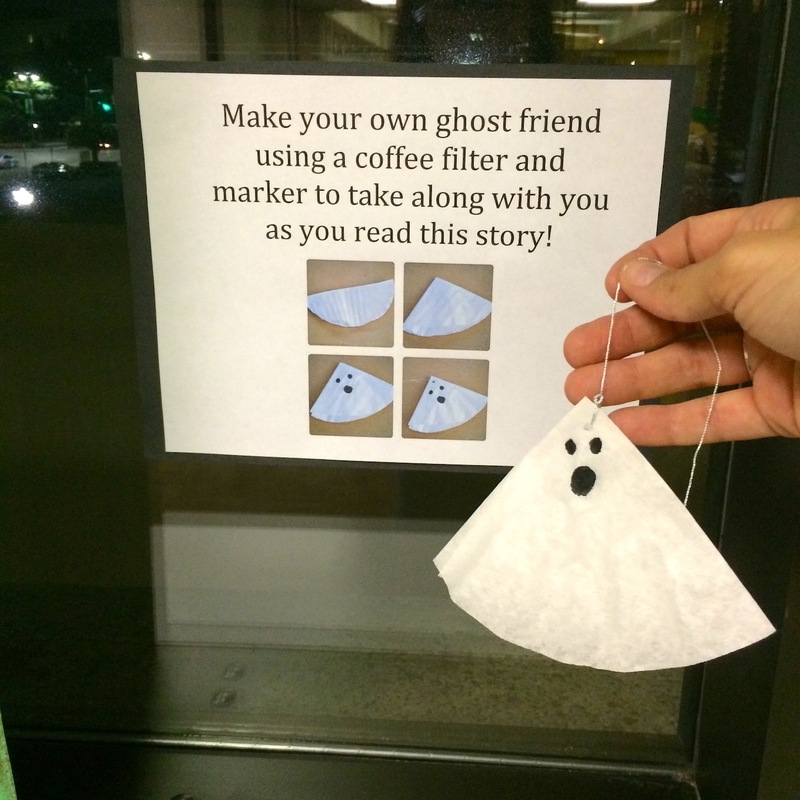 This storwalk started with making a little ghosty friend out of a coffee filter at a little self-serve station to take with while reading the story. 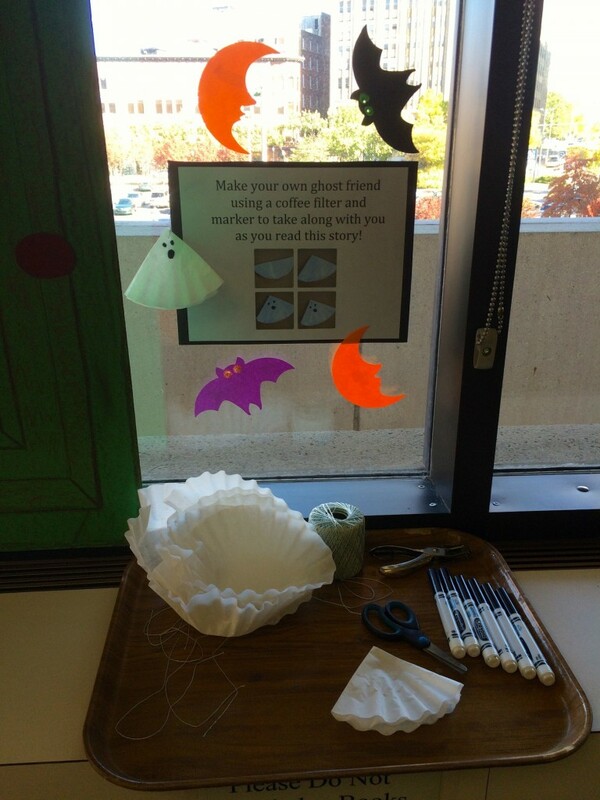 Easy ghost craft credit via Blog Me Mom. 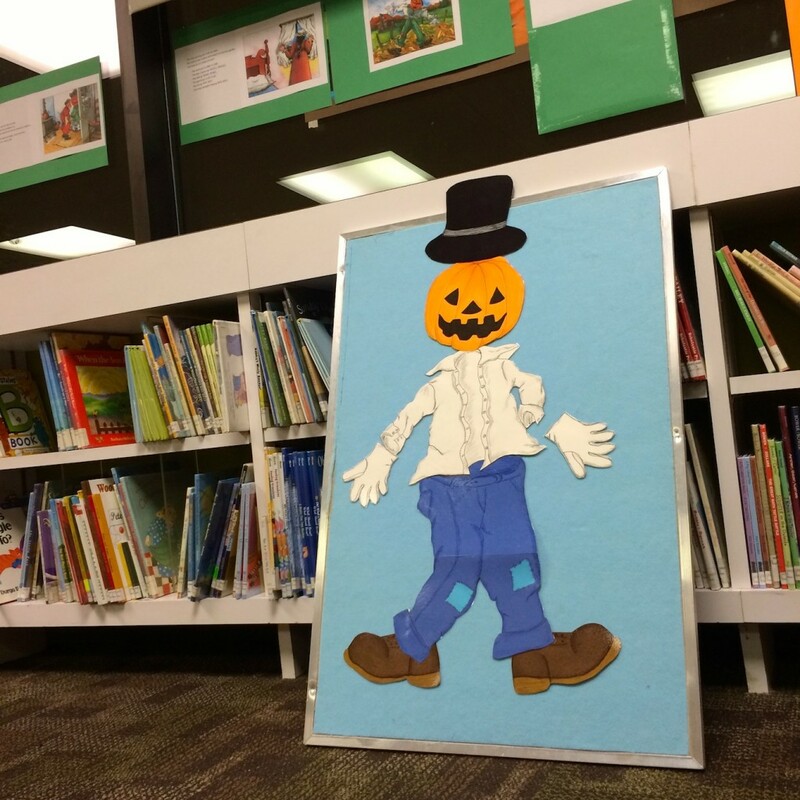 The activity for Big Pumpkin was an act out — Kids could choose what character to be using these fun costumes my co-worker, Emmy, made from this sequencing activity featured on Fun-a-Day. 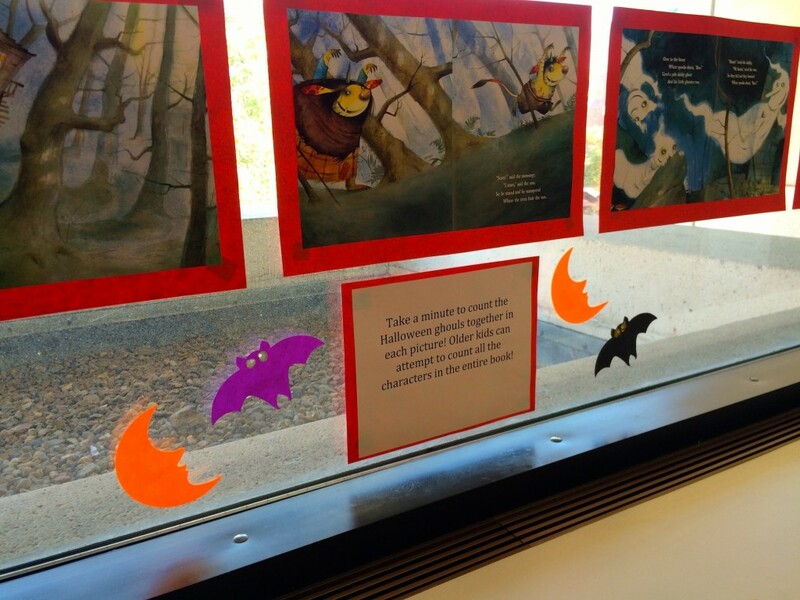 Little Goblins Ten had a couple activities: Singing the tune “Over in the Meadow” to the text in the story and/or counting the Halloween creatures on each page. Since there was interest in how this program was set up, I’ve outlined a short checklist of main items done in preparation. 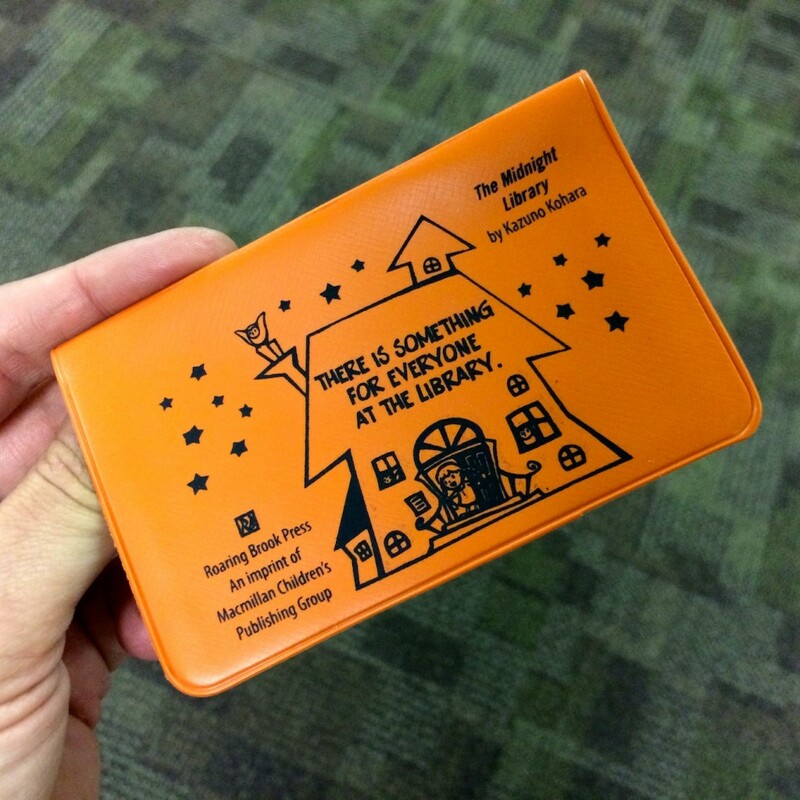 Nothing was purchased for this event– Everything used was in our supply closet, but a bit of prep work was required. 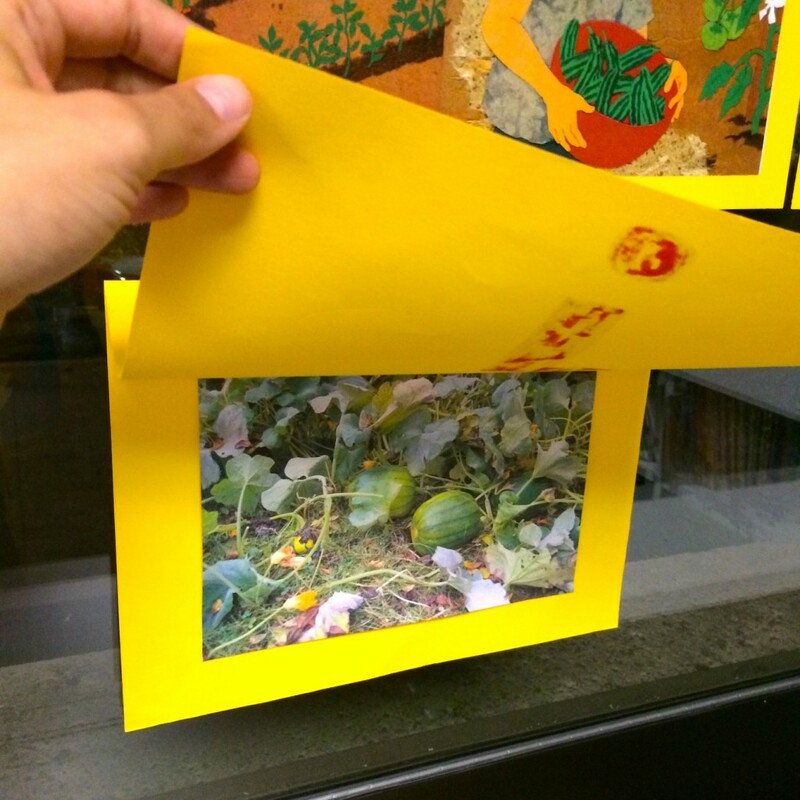 Ask publishers for permission to photocopy. I was told you probably don’t have to do this because the copies are not being distributed and because of the nature of the event, but I went ahead and asked anyway, because having permission is the nice and legal thing to do. 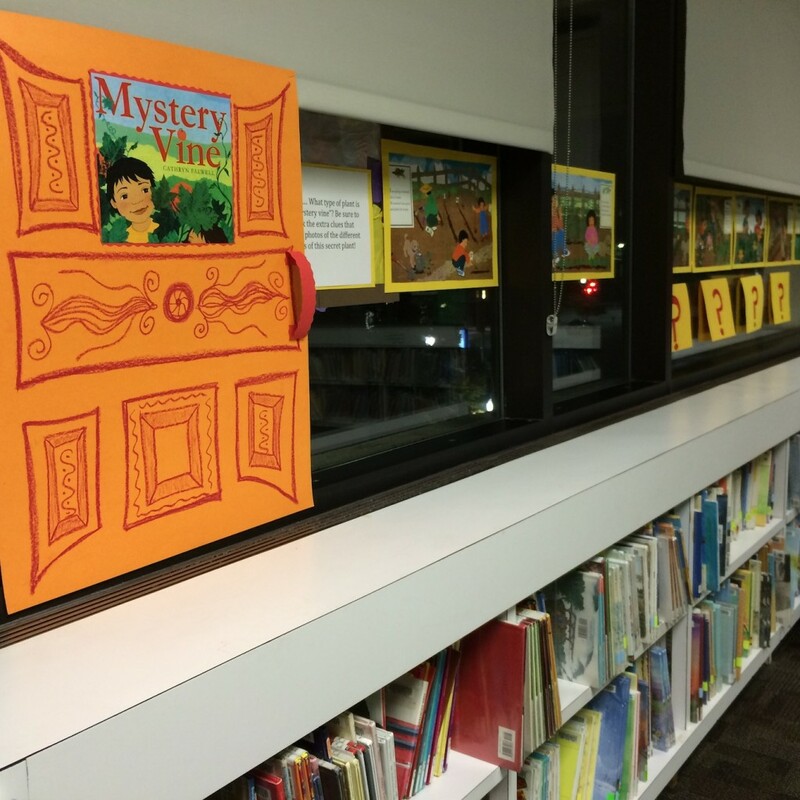 Photocopy interiors of the books chosen, trim, and mount to colorful construction paper or poster board using double stick tape. This took the majority of the prep time. 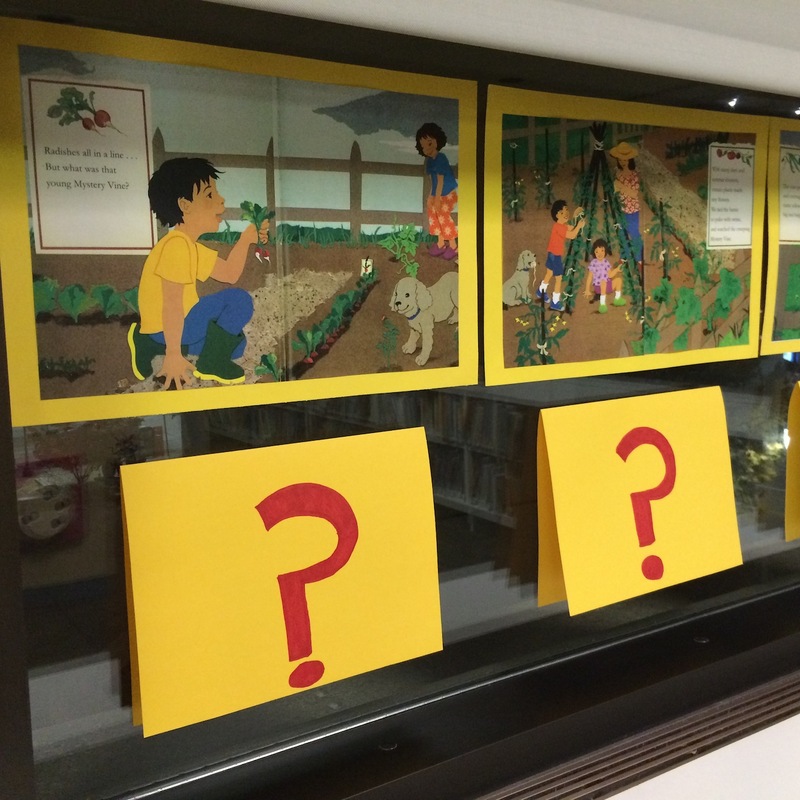 Create extension activities for each book. 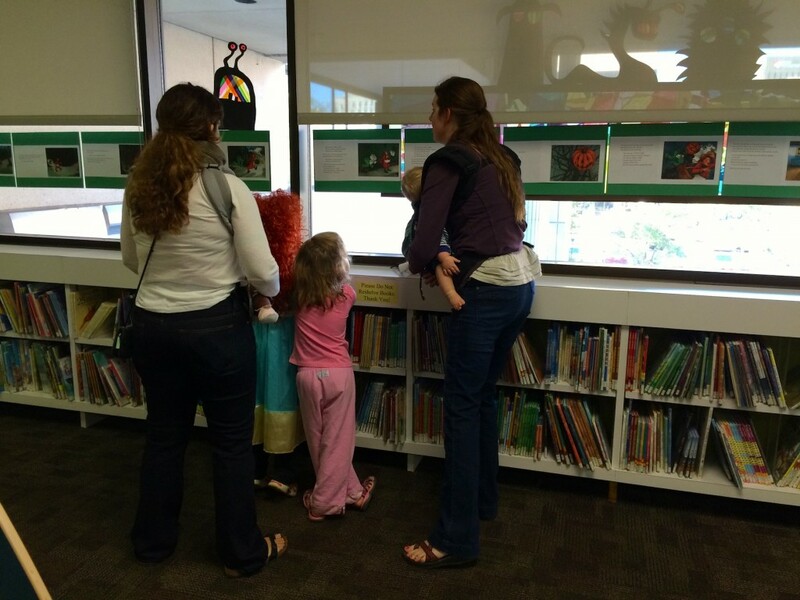 Host an opening event for families to view. 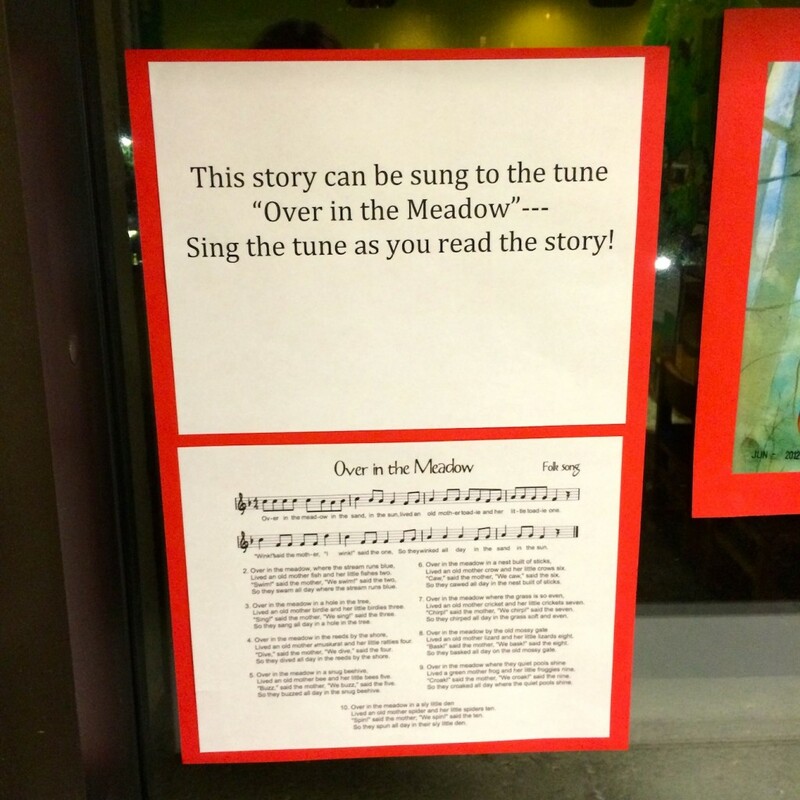 Maintain storywalk as needed. Keep posted for all to enjoy as long as you desire! And that’s pretty much it! 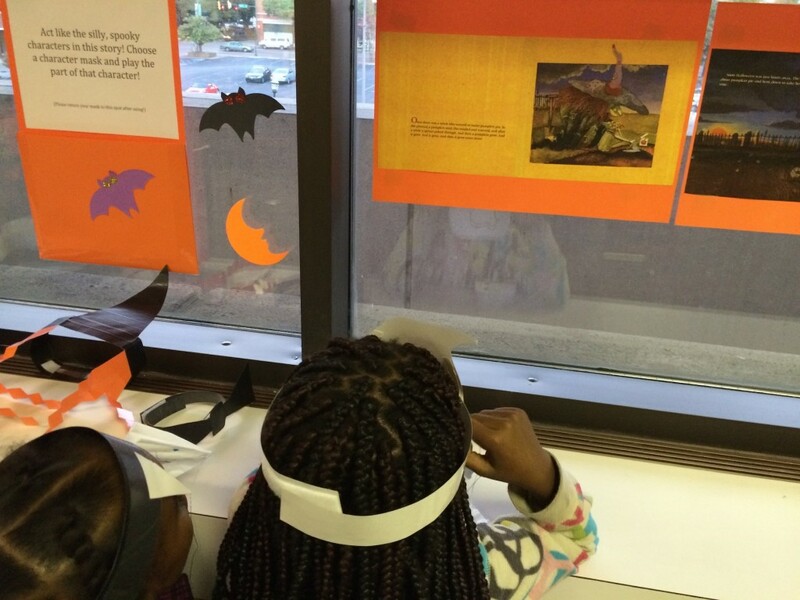 A lot of kids that visit the library walk or take the bus from the west side projects, and the goal was to create a unique, safe Halloween experience for everyone in the library. 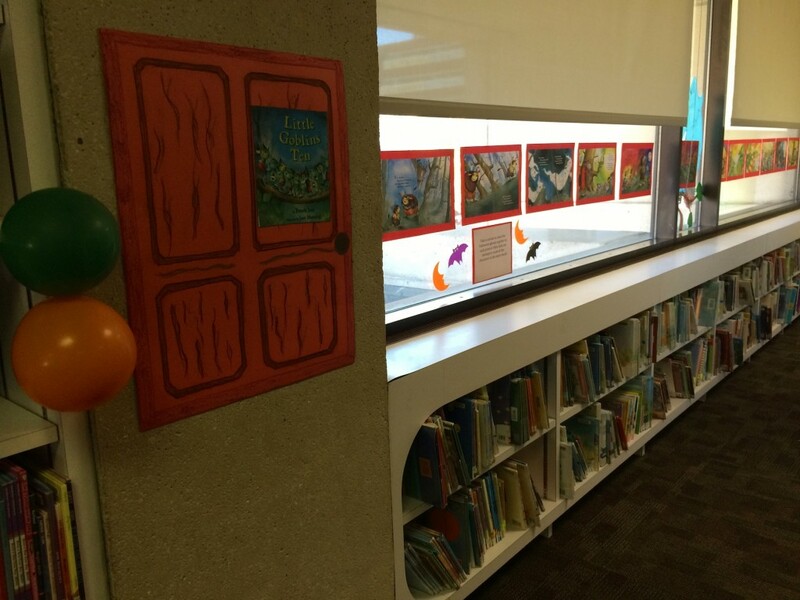 Plus, it promotes reading together! 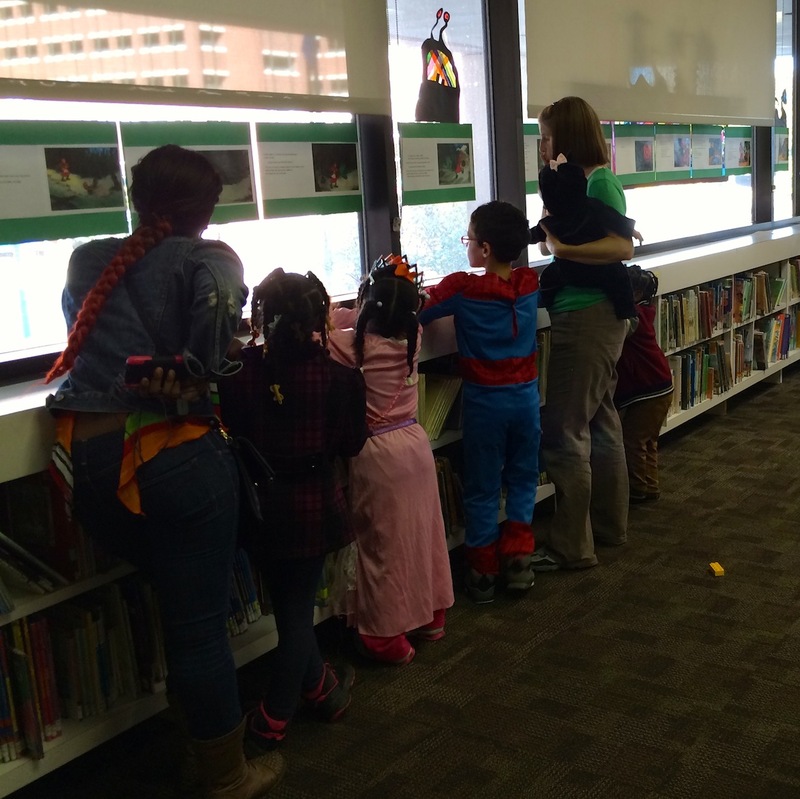 I had a couple families arrive who quickly realized that it wasn’t your everyday trick-or-treating experience, but instead of turning around and leaving participated in the storywalk and activities with their kids. 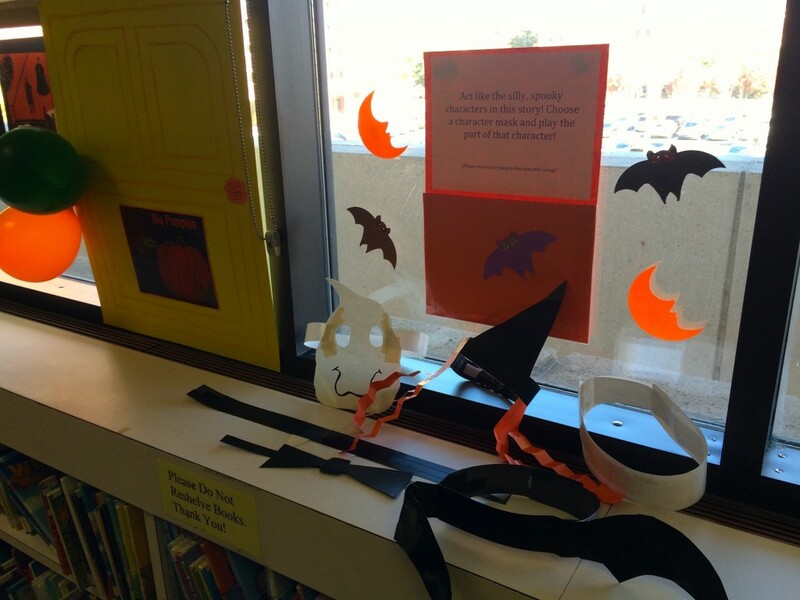 This idea was intended for Halloween, but it could absolutely be used with any favorite story, holiday, season, or theme in the library! The patrons enjoyed it so much, that we’re already started talking about possibly doing something for the winter season that would stay up for several weeks at a time with one or two books. 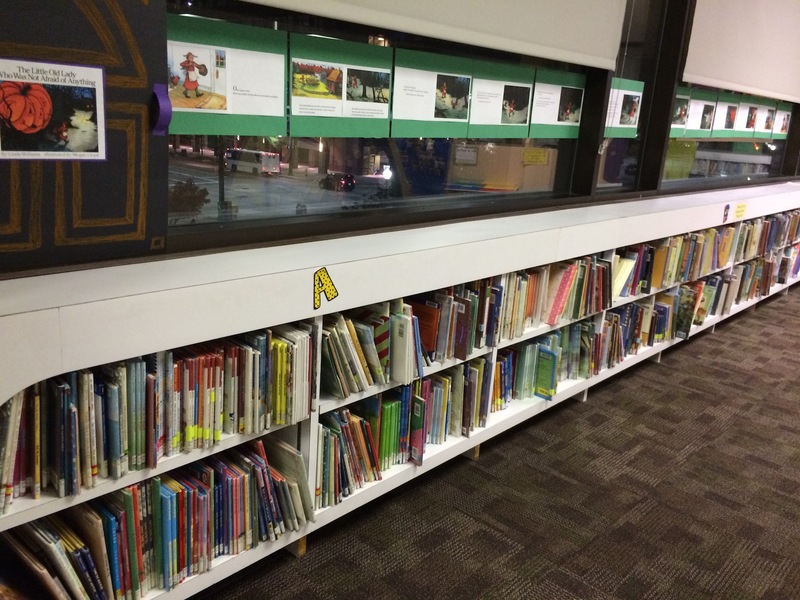 If you decide to do something like this in your library, let me know! I’d love hear about it! 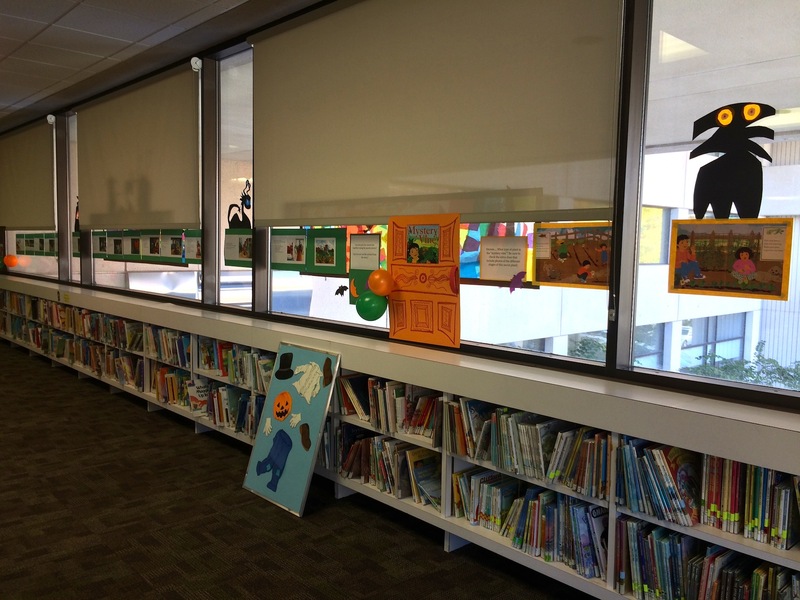 ** A big thanks to HarperCollins Children’s Books, Macmillan Kids, and Simon & Schuster Children’s Publishing for permission to use these books! 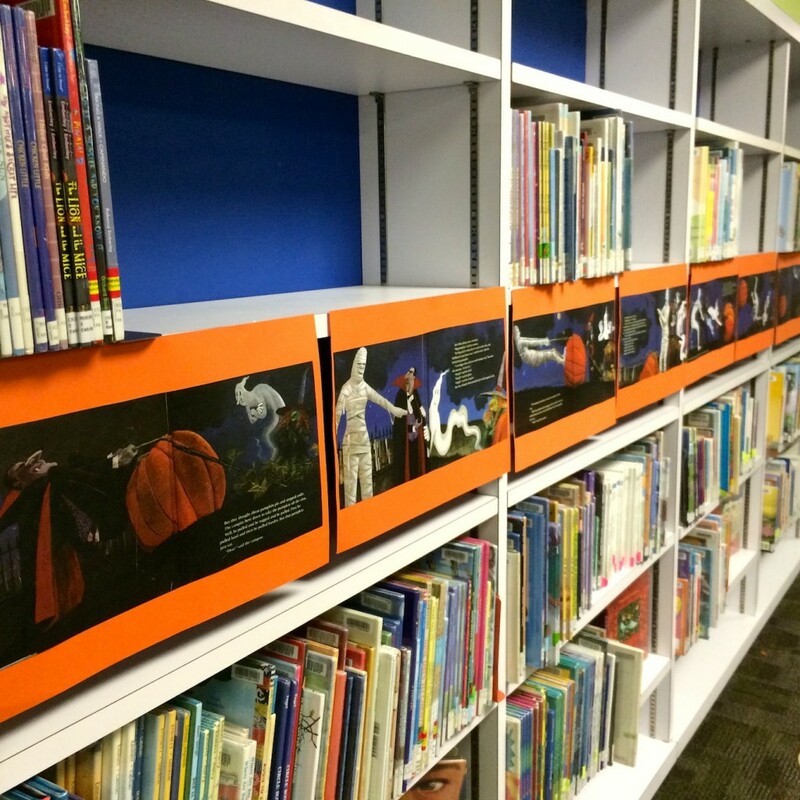 I adore this story walk you set up, and I’m honored that my Big Pumpkin headbands were included. 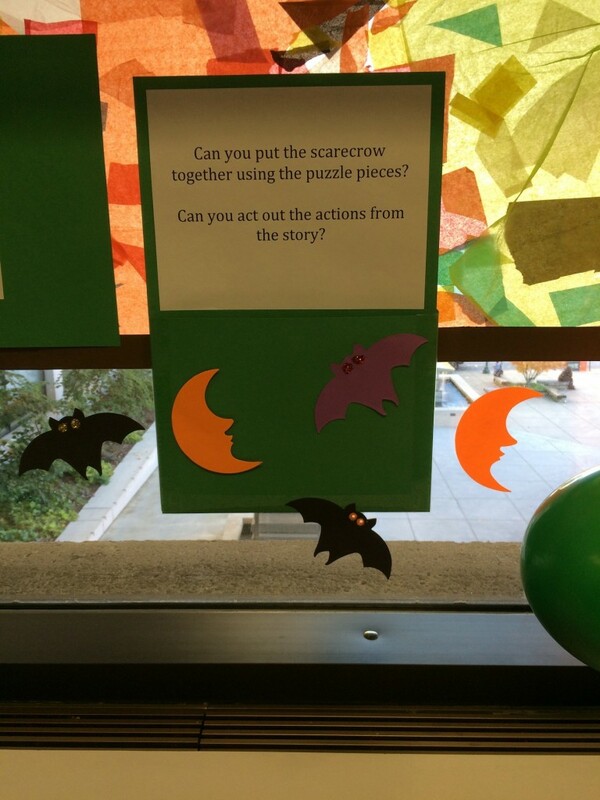 I’m excited to share this idea with some of my coworkers! 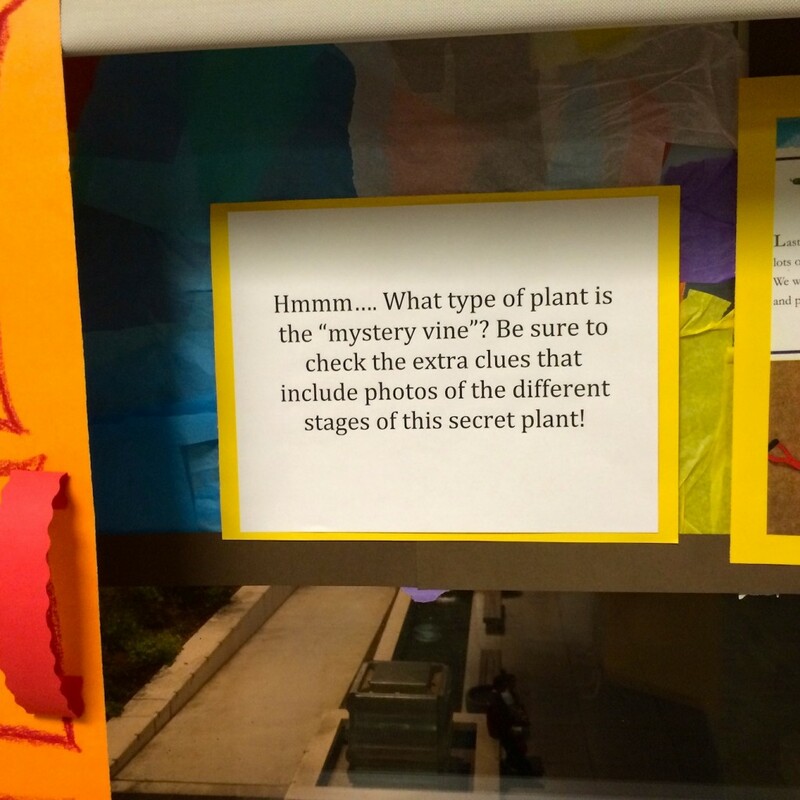 Thrilled to see MYSTERY VINE” as a StoryWalk at your library! What fun!